Luton interim boss Mick Harford paid tribute to the Hatters' players after they equalled a club record of 19 games unbeaten in the Football League this afternoon by seeing off Wycombe Wanderers 3-0 at Kenilworth Road. James Collins' 19th of the season and George Moncur's late double saw Town match the sequence achieved in the 1967-68 season and then between the end of the 1968-69 campaign and start of the 1969-70 term. 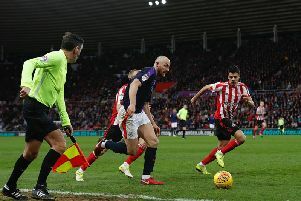 Harford, who has led Town in their last six league games since Nathan Jones departed, with five straight wins and one draw, said: “On equalling the record, I just said to the players in there, this football club has had some great players, had some great teams and to equal that record is a magnificent achievement for the group of players. “I take my hat off to them, they fully deserve it because the way they’ve gone about their business in that run has been amazing, so well done to the players. “They're a good team Wycombe, they make it very hard for you, they make it very difficult. “They have a style of play which is hard to combat at times, they matched up in terms of shape, they’ve got some very adequate players in certain positions and are hard to deal with.